About two weeks ago, I received my Amazon Kindle DX. I waited for this puppy for a while, and I had a personal weight loss goal to meet in June before I could buy it. Once I bought it, it tooks three weeks to arrive, since they’re back-ordered. I love, love, love my Kindle DX. It’s awesome. Everything I wanted it to be, and more. As someone who reads many books, but hates carrying books around, I’m happy. The reason I waited to write this review is that I wanted to thoroughly test it out, with books and PDFs, blogs and magazines, reading indoors and outdoors, in bright sunshine, and more. It passes all the tests with flying color. The pleasure starts with the packaging. The way it comes in the box reminded me of Apple’s product, like our recent Apple TV purchase. It’s pretty, it’s simple, and you just want to get cranking. The matching case, which costs extra (just like Apple ;)), is beautiful and convenient. 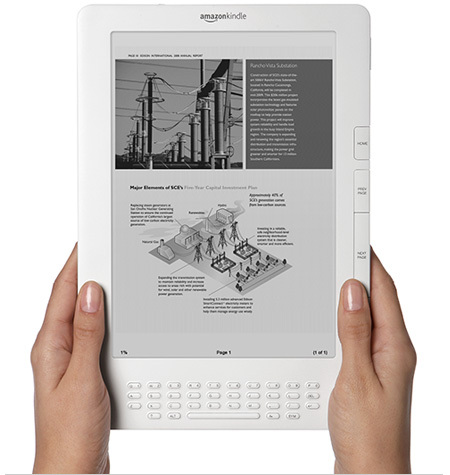 The Kindle itself is trivial to use. I still haven’t opened the user manual that came with it. The welcome user’s guide on the device is good and useful. I’ve bought books and samples, no trouble. It’s nicely hooked up to my Amazon account. I like how when you want to buy something, it’s one click, and then another click if you want to cancel your order, e.g. if you made a mistake. Not a click needed to confirm the purchase. My only nit is that I wish pages refreshed a bit faster. There is a noticeable flicker when moving to the next or previous page, and it takes a second, but it’s not instant. I wish it were. Obviously something in color would be cool, but I perfectly enjoy reading books in black and white. Also, KindleFeeder.com is a nice service. The only magazine I pay for is The Economist, and I was hoping I could just somehow get the Kindle Edition on the device without paying more. But that seems impossible. However, via KindleFeeder, I can get the full current edition, through the RSS feed. Nonetheless, The Economist should give paying subscribers a way to get this edition too.